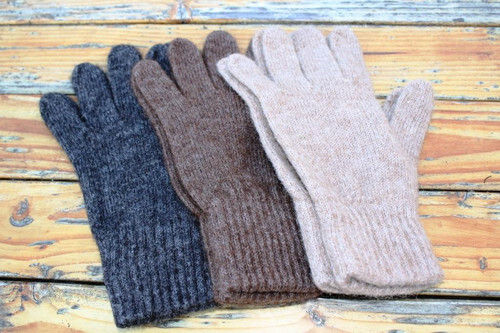 Colors: See picture, gloves in order: Charcoal Grey, "Carhart" Brown and Light Camel/Fawn. Sizes: Unisex: Small, Medium, Large and X-Large. May run a little small... just a little... so if you're on the edge. Functional yes! But they're also quite attractive in soft subtle color shades. They look, feel and work great! Care: Hand wash in room temp water with gentle laundry soap (or better yet, mild hair shampoo) and air dry for longest life. TIP! Some have reported wearing them as a liner INSIDE another glove for an extreme warmth combination, smart! Have questions about this product? Size and colors available or fit, email me at alpacasoth@gmail.com.